Can you believe Christmas Eve is only 9 days from now? Before we know it, Santa’s Big Event will be upon us. 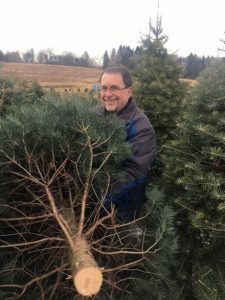 Somehow despite our hectic pre-Christmas busy-ness, Tom and I managed to schedule a day to play hooky from the Chalet down in Market Square to indulge in a festive new tradition – cutting down our own Christmas tree. We decided to try cutting down our own tree for the first time last year. It was really pretty, but we thought it was maybe a little too small. So this year, of course, we had to overcompensate, and perhaps we overdid it a bit. We had to cut a whole foot off the bottom and trim the top, but we finally got it to fit. 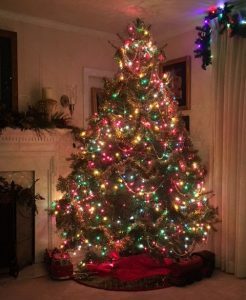 Now we can sit back and enjoy the beauty of our tree as well as the satisfaction of a job well done. All is right with the world! Isn’t shopping for the holidays a little like that? First, you have to find the time to go shopping. And then it seems so intimidating… such a large task! We’ll never get it done! So you buy a little here, a little there – and then all of a sudden, you’re finished. Once that’s off your plate, you’re entitled to just sit back and enjoy the holiday beauty all around you, guilt-free. I would be happy to help you achieve that state of holiday bliss that comes when you know your shopping is finished! 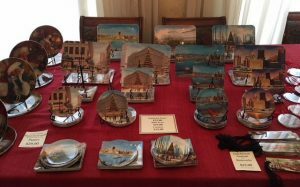 My art and giftware make unique and personal gifts for everyone on your list. I’ll even personally sign each and every gift for your loved ones. 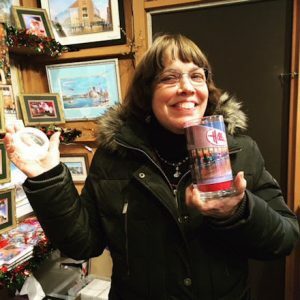 White elephant gifts, office ornament exchanges, and special gifts are my forte! I have tons of ideas for you. I’ll be at my Chalet every day for the next nine days. And if you’re up for a Sunday drive this weekend, I’ll be at Wendell August Forge in Grove City from 11-3 signing my work there. I ho-ho-hope to see you soon! Look Who’s Hanging Out in Market Square! 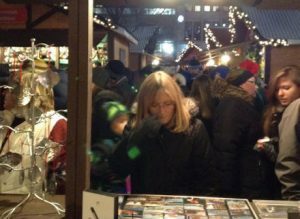 Despite the long hours and cold weather, one of my favorite parts of the Holiday Market is people-watching … looking out from my Chalet to see folks sharing the holiday spirit, shopping, and enjoying hot chocolate and live music. At this time of year, Market Square truly feels like the heart of the city. Folks from all walks of life gather here to enjoy the Holiday Market. People not only from the many neighborhoods of the Pittsburgh area, but from many different cities, states, and even countries as well. What do they have in common? I think it’s our love for each other and for this special season of joy, and I see it here every day. I may not be “Home” much lately, but being here in Market Square fills my heart with joy. I just love hearing from people after they have received my art as a gift – it’s like the happy ending of a story… and who doesn’t love a happy ending? I also wanted to share a beautiful photo I recently received from JP Diroll, a dear friend who happens to be a very talented photographer. 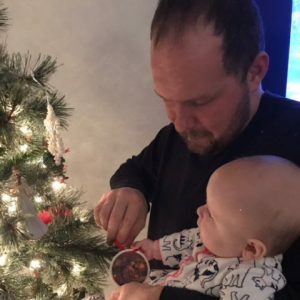 Here, JP is helping his little daughter hang one of my ornaments on their tree as she celebrates her first Christmas. The highlight of my week, however, involved a very special visit from an old friend. 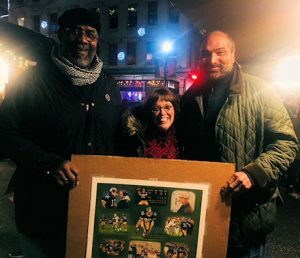 Franco Harris dropped by the Chalet this week, accompanied by his friend Mean Joe Greene (who in real life doesn’t have a mean bone in his body!). 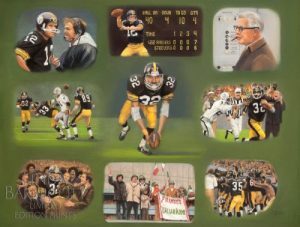 Franco wanted to purchase a signed print of my painting “Franco Harris – The Story of the Immaculate Reception” for his friend, Joe. I came outside the Chalet to get a photo with Franco and Joe, and as you can see, I look awfully small between these two legends – big guys with even bigger hearts. How Franco and I were text buddies during the process of creating the painting. We were always texting back and forth about some tiny detail, like whether the color of his wristband was exactly right. The reason I added Frank Sinatra and Myron Cope to the painting was because they were Honorary Generals in Franco’s Italian Army. How I had originally placed the Game Ball in Franco’s hand as he returns to the locker room in victory… but I didn’t know they actually had lost that very important ball that day! It was a lot of fun hanging out that evening with Franco and Joe and their lovely families. I’m in awe of how they were so giving of themselves, happy to spend time with their fans, smiling, shaking hands, and taking picture after picture with anyone who asked. It just goes to show, you never know who you might run into in Market Square. Come on down and say hello! Greetings from the Chalet in Market Square! … pretty much my home-away-from-home until December 23rd. With the frosty weather this week, I’m really glad I invested in some Arctic-grade long underwear! 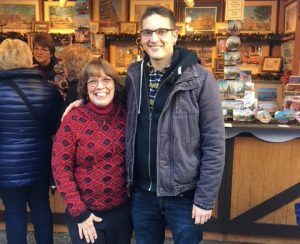 But one of the things that bring some sparkle to all those long cold days is the wonderful visitors who come to see me there. 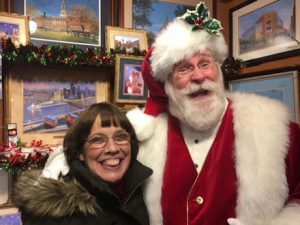 First, of course, The Jolly Old Elf himself has been visiting with children in his Market Square Santa House, and he stopped by on his break to say hello. I have a feeling he just likes looking at all those paintings he’s in! 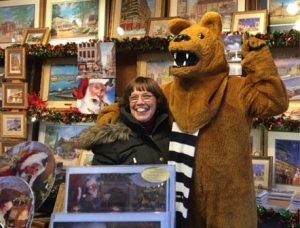 Then just yesterday, the Penn State Lion was passing by my chalet, and he practically flipped out when he saw the painting of Old Main on the top shelf. He couldn’t stop hugging me and thanking me for the memories it brought to mind. The video crew he was with even interviewed me about the Market! But the most meaningful, heartwarming visit this week was with a young man named Michael. Michael explained that he had served in the Marines, and he’s now newly married and living in Boston. He was visiting with his Pittsburgh family for the Thanksgiving holiday. 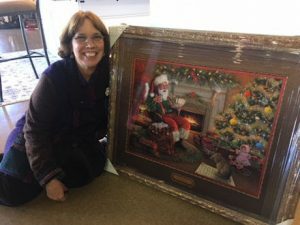 I think my heart swelled to three times its size that day – to think that a little magnet of my painting, “My Hometown,” meant so much to this young man that he made a special effort to thank me. So this holiday season, take a few moments and let someone in your life know how much a small gesture meant to you. You may just make their holidays a brighter, warmer time… like Michael did for me. Have a great week, and if you’re in town, please stop by the Chalet and say hello! P.S. – Treat yourself to an old-fashioned Christmas! My daughter Brittany will be representing the Barnicotts at this year’s Christmas at the Village at Old Economy Village. We are participating for the first time with my paintings and gifts at this lovely show. Take the family to experience a German Christmas of the 1800s with candlelit pathways and decorated buildings. You can even visit with Belsnickel – Santa’s Pennsylvania Dutch cousin! Christmas at the Village will be open to the public from 2 to 9 pm on Saturday, December 1st and Sunday, December 2nd from 2 to 7 pm. Happy Thanksgiving from the Chalet! Thanksgiving is that wonderful time of year when I kick back and remember how grateful I am for all of you. Every one of you has brought great joy into my life! Just knowing that you read my blog each week and you’re interested in keeping up with my family and my art career means so much to me. You are the reason I paint, whether it’s our beloved Pittsburgh, familiar landmarks… and of course, the Big Man himself, Santa. So for this special holiday weekend – and that includes Black Friday, Small Business Saturday, up until midnight on Cyber Monday – I’m hosting a sale on my website. Anything and everything on my website is 10% off this weekend, with the added bonus of Free Shipping on orders over $100.00. Just enter the code GRATITUDE when you order. P.S. –‘Tis is the season to be grateful for family and friends! Happy Thanksgiving from the Barnicotts. Ready or Not… Here Come the Holidays! It seemed like Fall was playing games with us this year, and the leaves took forever to turn. But finally the fall foliage has arrived, filling our world with a plethora of beautiful colors. I was afraid we would miss out on that this year with all the unusual weather. 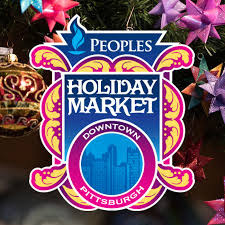 It’s hard to believe, but in just one week, it’s time for my longest (and favorite) show of the year – the Pittsburgh Holiday Market in Market Square! As they do every year, the Market will have a Soft Opening on the day before Light-Up Night. This year, that date is Thursday, November 15th. (Yes! That’s less than one week away!) Though it won’t be advertised, the Market will be open from 4 to 8 pm that evening. The reason for the soft opening is to test the lights and make sure all the bugs are worked out before the real Light-Up Night festivities begin. Not many people actually show up because not many people know about it. So I’d like to invite you, my favorite customers, to join me downtown for a Soft Opening Jump Start Sale at my Holiday Chalet! I’m offering a straight 15% off everything in my Chalet for my readers. Just print this email and bring it with you to my Chalet next Thursday between 4 and 8 pm. You can find me near the live stage. What if you’re busy that night or out of town? I’ll save you the travel time and gas by offering Free Shipping on everything on my website for one day only – from 12:01 am, Thursday, November 15th, until 11:59 pm that night. Taking advantage of the one-day-only online free shipping isn’t quite as good as being there, but close enough! I’ll be happy to personalize your gifts if you just mention it with your order. 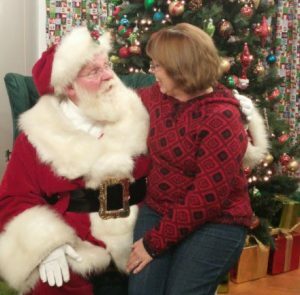 Many of you have asked about Santa’s schedule for the Christmas season. Listed below are the dates he will be at the Santa House in Market Square. Please bring your kids, your cousins, your nieces and nephews, your neighbors, your friends, your parents and grandparents, and especially YOURSELF and have a fun time together! 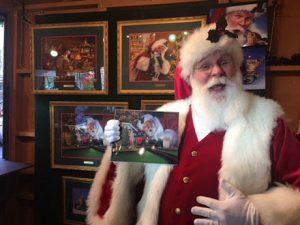 If you purchase any of my Santa paintings, he may even be able to sign them. Before things get rolling at the Chalet next week, I have one more pre-holiday show on Saturday (November 10) at Bethel Presbyterian Church in Bethel Park. I will be there in the auditorium from 9 am to 3 pm. If you’re in the neighborhood and want to check out a great craft show, please stop by! Have a great week! I’m looking forward to seeing you or hearing from you this Holiday Season. Today I’m at the Giant Oaks Garden Club’s “A Victorian Tinsel Christmas,” and I’m taking advantage of a little break in the action to sit down for a bit, catch my breath, and write a quick note to you. I’m still playing catch up after last week’s very successful – and very fun! 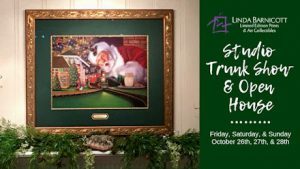 – Trunk Show and Studio Open House. The folks who came by really seemed to enjoy both the evening and the daytime events. I’m very grateful for everyone who showed up and for the opportunity to spend time just hanging out and talking with everyone. In fact, the event was so successful (and so much fun) that I believe I may make it an annual thing! So look for the Second Annual Trunk Show and Open House event next year at our new home/studio in Brentwood. Tomorrow, Tom and I will be doing our “divide and conquer” strategy again – I’ll be spending the day at John McMillan Presbyterian Church (875 Clifton Rd, Bethel Park, PA 15102), and Tom will be representing me at Christ United Methodist Church on Highland Road in Bethel Park. Please stop by and see one of us (or maybe even both of us?) and kickstart your holiday shopping with a special gift. Studio Trunk Show and Open House – This Weekend Only! If you’ve been keeping up with my last few posts, you know I’m hosting my most unique and unusual event ever this weekend. My Trunk Show and Open House will take place at my studio this Friday, Saturday, and Sunday. On Incentive Saturday (October 27th) from 10AM to 3PM, I’m offering percentage discounts – the more you spend, the greater the savings. Sunday (October 28th) from 1 to 3 pm will feature unadvertised Mystery Specials that won’t be revealed until the day of the show. There will be homemade cookies (not made by me, but sooo good), apple cider, dips, and chocolates to munch on (from my palette to your palate?) as you browse my studio looking for that perfect gift or addition to your home. Remember, originals will only be on sale (20% off!) at the Friday evening event. So if you’ve always wanted one of my original pastels, Friday evening is definitely the best time to visit. I am so excited to invite you into my studio! But if you can’t make it or you live too far away, I’ll be offering an online special for this weekend only. Everything on my site will be 15% off… and if you spend over $100.00, you’ll also receive free shipping on your order! To claim your exclusive discount, type in the code SUPERSALE. So hurry – Don’t wait! When the clock strikes midnight on Sunday, the sale will be gone. Happy shopping! P.S. – Don’t forget! If you’re planning to attend, please RSVP to my email at linda@lindabarnicott.com. You’re welcome to bring friends – they don’t need to RSVP if they are with you. 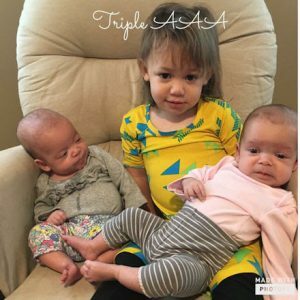 P.P.S – In breaking Twins news, the girls have hit a milestone! They’re now 3 months old and over 9 lbs each! 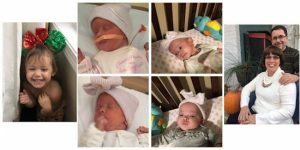 Aria loves her sisters, and the family is settling into the New Normal. 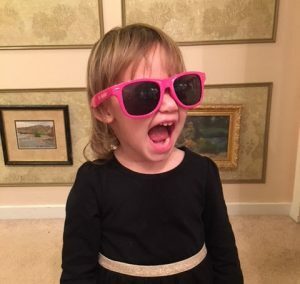 I’m super excited about the special event I’m hosting this weekend – because it’s going to be my most unique and unusual event ever! My very first Studio Trunk Show and Open House will take place right here at my home studio on Friday, Saturday, and Sunday, October 26th through 28th. Saturday, October 27th is “Incentive Saturday.” From 10 am to 3 pm, I’m offering percentage discounts – the more you spend, the greater the savings. Then on Sunday, October 28th, from 1 pm to 4 pm, I’ll be featuring unadvertised “Mystery Specials” that will be a secret right up until the day of the show. 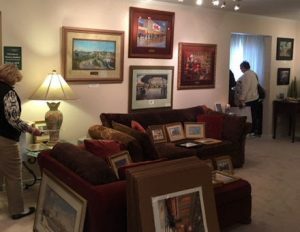 This is a great opportunity to find something unique and special for the people on your Christmas list… or maybe just to treat yourself and buy that painting you’ve always wanted! I hope you’ll join us for this fun event! Please RSVP by email to Linda@lindabarnicott.com. P.S. – I also have an important announcement that has been a long time coming. Tom and I have discussed it for many months, and for various reasons, we have decided it’s time for him to change careers. At some point in your life, there comes a time when you have to look at what is in front of you. Though ministry will always be a part of who he is, and he will be listening to God’s guidance as he starts this next chapter, Tom will be retiring at the end of January. Sometimes you just know when you make a decision that it’s the right thing to do at the right time. 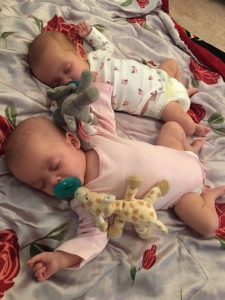 We know this is the best path for us going into the future for a number of reasons, especially with the birth of our new twin granddaughters. Tom and I will be moving to a new home and studio in Brentwood at that time. I’ll fill you in on the details as things develop. 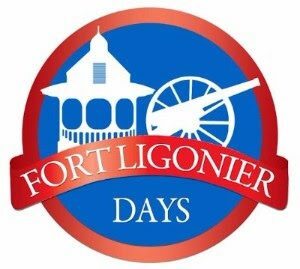 Have you ever been to Fort Ligonier Days? 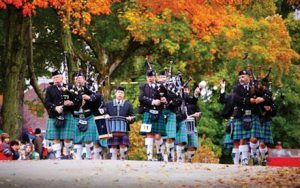 Fort Ligonier Days is one of my very favorite shows of the year, especially with the beauty of the fall landscape and the wonderful people who always come to this event. It’s a fantastic all-day experience with great food and music, historical re-enactments… and of course, the finest art and gifts! It looks like the weather on Friday, Saturday and Sunday will be perfect for a day trip out to the country. I’ll be in Booths #16-17 in the Loyalhanna Lot located off South Market Street behind the fort. The show runs October 12th through 14th from 9 to 6 on Friday and Saturday and then Sunday from 10:30 am to 5 pm. Come out and see all the wonderful new things I have to show you for the holiday season! Tom and I are celebrating our 38th anniversary today, and this year I decided to surprise him with a very special and meaningful gift. When we first got married, I commissioned a painting for Tom from a fellow artist and dear friend, Joe Stasny, who has since passed away. Joe was an amazing watercolorist and loved painting wet-on-wet – meaning that the paper is wet the whole time you’re using watercolor paints. Wet-on-wet can be pretty challenging, as I know because I took a few classes from him. They say that in the watercolor field there are “Happy Accidents.” Well, I never had one of those, and I never was really able to master that technique. Anyway, Tom loved Joe’s work, especially a painting he had entitled “Winter’s Eve.” So I asked Joe if he could make a morning version of it for Tom; hence, “Winter’s Morn.” After all these years, the frame was looking a little shabby (I didn’t know about acid-free or museum-quality framing back then). 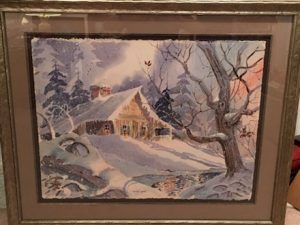 So for our anniversary this year, I surprised Tom with “Winter’s Morn” in its new frame. It’s amazing how just putting it in a new frame has brought the painting back to life. So if you have a painting that you love that looks tired or beat-up, I encourage you to re-frame it, and you’ll enjoy it again as if it were brand new. 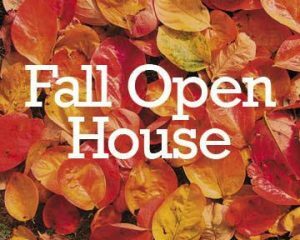 In just two weeks, I’m hosting my most unique and unusual event ever – my Trunk Show and Artist Open House will takes place here at my studio on Friday, Saturday, and Sunday, October 26th through 28th. And of course, you’re invited! Friday Preview Night (October 26) will run from 7 to 9 pm and will feature 20% offeverything in the show except “Super Savers” – INCLUDING ORIGINALS! On Incentive Saturday (October 27) from 10 am to 3 pm, I’m offering percentage discounts – the more you spend, the greater the savings. Sunday (October 28th) will feature unadvertised Mystery Specials that won’t be revealed until the day of the show. Full details to come in next week’s email! So head out to Fort Ligonier Days this weekend and stop by the booth and say hi! I’ve packed up my van as well as my car without an inch to spare, and we’re heading out to Ligonier to begin set up as soon as I finish this.